You can tell that I really enjoyed Illumination Entertainment’s Sing, can’t you, readers? In all honesty, when I first saw the trailers, I did not think I would like the film. But then I began to take an interest in the trailers and found myself getting more and more curious about the story. Finally, I had the desire to watch the movie, and I convinced some friends to view it with me after it came out on DVD. My post Sing: Of Hope and Optimism, covers my opinion of the show’s plot. In this Spotlight! post, I want to focus on one of the best characters in the film. And no, he is not my favorite; that honor lands squarely on Rosita’s shoulders. Even during the trailers, she was the one I “connected” with on sight. 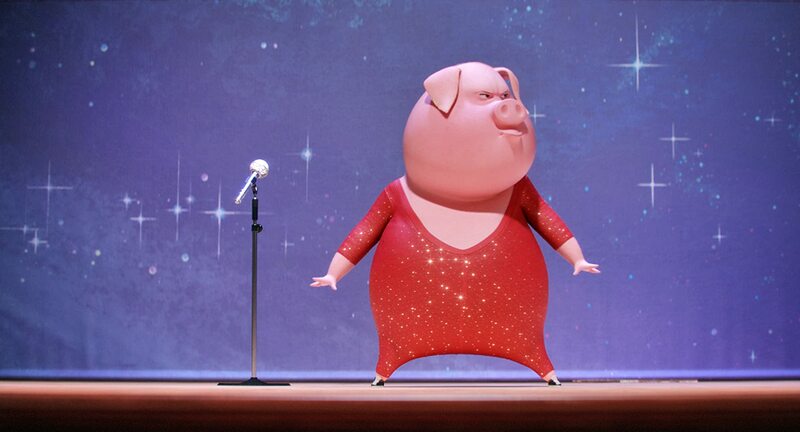 Gunter is a European pig who somehow came to live in the city that is home to the other characters in Sing. Judging by his name, he is either from one of the Scandinavian countries or he is German. He has an accent that sounds like it is from that region. 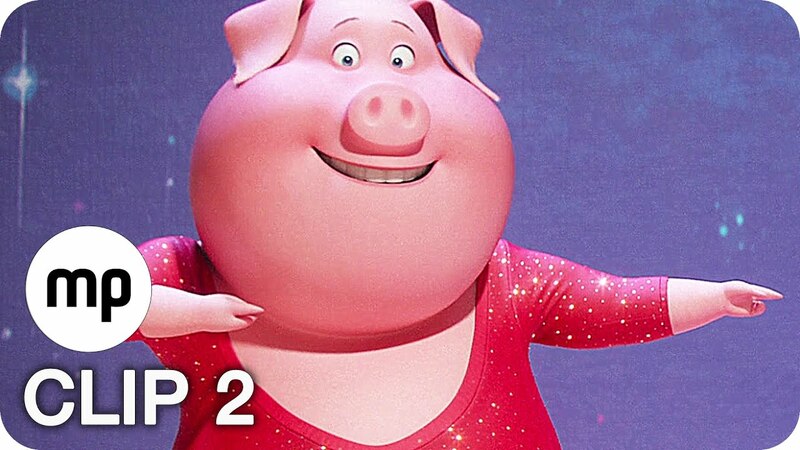 He also likes to wear sparkly body suits for some reason – probably because he has no qualms about showing off his “major piggy power” to the world whether they like it or not. Anyway, after we watched the film, my friends and I fell to discussing it. Eventually we asked each other who were our favorite characters. In the process, we all discovered that we liked Gunter – even when some of us were sure at the start of the film that we would hate him. I got to thinking about this a little while ago. Though my friends and each had a different favorite character in the film, we also had a lot of affection for Gunter. I wondered why this would be and came up with a possible answer some time ago. Gunter is a hopeful pig, as I said in Sing: Of Hope and Optimism. Anyone who tells you that hope is not an attractive virtue has to be lying through their teeth. The reason that I say this is because I think that this quality of Gunter’s is one of the reasons that my friends and I like him so much. As I said in the previous post, Gunter never loses hope. Now hope is not some ethereal, blithe belief that sunshine and rainbows will follow you everywhere you go. It is not a flimsy outlook that makes you go around smiling like the Joker every minute of every day. As I said before, real hope is the desire for some good you do not have but which you want to obtain, and which you are willing to stay the course to achieve. Things happen in Sing that make Gunter sad, that make his face fall. But the key thing here is that he does not let these things keep him down. He can handle disappointment just as well as he can handle success; one will make him sad while the other will make him happy. But the fact is that failing or having a streak of bad luck is not going to break his spirit – and that is an amazingly great characteristic to have, readers. This is the other thing that is so wonderful about Gunter. He has a palpable zest for life. From his enthusiastic dance moves to his belting out the lyrics as he sings to the energetic encouragement he offers his fellow competitors/performers, Gunter exhibits a contagious joi de vive that cannot help but bring a smile to the viewer’s face. He does not enter the competition for the money as much as he does for the fun. With the exceptions of Mike and, to a lesser extent, Ash and Johnny, none of the other performers audition to win the prize, either. It might have caught their eye initially, but for the most part they came to the theater to do something they enjoy. And boy, does Gunter enjoy performing! Gunter also shows a sense of empathy and kindness in the movie, such as when he helps Rosita comfort Ash after her boyfriend dumps her. He does it again when Rosita succumbs to her self-doubt and leaves in the middle of rehearsal. He is, in many ways, the perfect counterpoint to Rosita, who has become so accustomed to being in the background that she stresses out about finally entering the spotlight. Not one to be part of the stage scenery, Gunter does his best to encourage Rosita to come out of her shell and strut her stuff. Thanks to Mike, his first attempts do not work very well, but Rosita later shows an appreciation for his efforts after she returns to the stage. These things all add to Gunter’s natural sense of fun, which makes him such a happy performer. He does not care if people think he looks silly or stupid or like a dancing bowl of Jell-O. He is going to have his fun, and people can either have fun with him or laugh at him. He will shake off the mockery and laugh with those who laugh with him. All these qualities come together to make Gunter a likeable character who could qualify as the bonding, emotional heart of the cast. At first he seems unimportant, but by the end of the movie, you wonder how any of the characters would get along without him. He is one of the big selling points in Sing for this reason, and this is why I would say he is probably my second or third favorite character in the film. In a world where hope, fun, joy, and simple kindness are mocked and derided, it is nice to have a character that possesses all these traits and does not give a fig whether or not others care for these things or him. We need more Gunters in the world, readers. They make it a better place by far. This entry was posted in Spotlight! and tagged Animated films, Despicable Me, Gunter, Illumination Entertainment, Johnny, Matthew McConaughey, Meena, Mike, Miss Crawley, Movie Reviews, Nick Kroll, Norman, pigs, Reese Witherspoon, Rosita, Scarlett Johansson, Seth MacFarlane, Shake It Off, Sing, singers, singing, Spotlight!, Taron Egerton, The Secret Life of Pets, Tori Kelly on October 4, 2017 by The Mithril Guardian.